When you’re planning an event, whether it’s a festival, wedding, rock concert, or trade show, event security should be high on the list of your priorities. You’ll want to make guests feel welcome and safe. Appropriate tenting and other measures will accomplish this. Here we look at the most popular and useful structural tent structures for use in event security, as well as some of the security issues that modern event tenting needs to address. The biggest threat to security at your event is very rarely the one that draws most attention. Terrorism, natural disasters, and assassination are rare events. The biggest threat to the success of your event comes from everyday events – children becoming separated from their parents, cuts and bruises that need attending to, intoxicated guests, and gatecrashers. 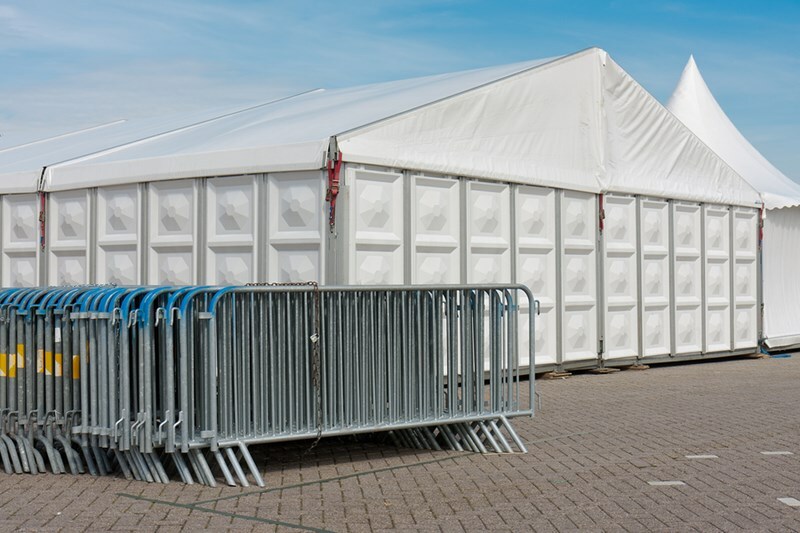 By using appropriate tenting and crowd control accessories, you’ll be giving your guests peace-of-mind and easily recognizable emergency locations within and at the event perimeter. Crowd control equipment can be customized and have your logo added – providing even better safety recognition. What security equipment will benefit your event? The requirement for safety and control of crowds, workers, event organizers and VIPs is paramount. Rope stations, picket fences, cones, bell stanchions and steel barriers are all accessories which aid on-site security and help navigate crowds in the required direction. These types of tenting are frequently used at security check points, passenger terminals, retail space, and as longer-term construction site shelters. They’re ideal for temporary storage areas. Other security measures that are becoming common at events include RFID wristbands. While these are expensive, they do enable close monitoring of all comings and goings of every event attendee at every entry and exit point: and that could help in the planning of future events. If you are concerned about event security – and who isn’t? – you’ll want to ensure that your tenting and security accessories are man enough for the job. Contact Main Attractions today – we’ll walk you through your options and ensure that you take a comprehensive view of needs versus cost-effectiveness.